What’s the meaning of the Buenos Aires tango to me? This is a picture that was taken of me while attempting to dance the Tango in Buenos Aires, Argentina. The accompanying quote says as much as ‘Without the streets or dusks of Buenos Aires a Tango cannot be written’. And in a way that quote shows me that you need both the dark and the light. You need the good and the bad to have a balanced life. It’s the same with happiness. 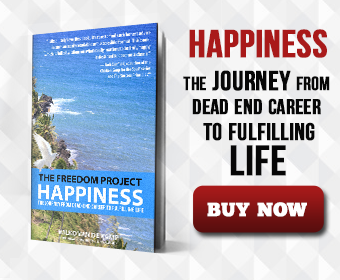 Happiness levels will go up and down – and up and down. What really makes a balanced life is to live life out of a state of joy. And instead of focusing on the things that happen to you that you really have no control over, focus on the response that you give to those things and living a life taking a hundred percent responsibility for that life and going after what it is that you truly want.